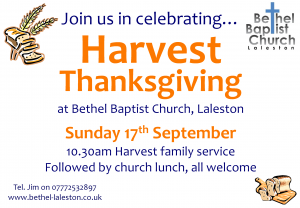 We will be celebrating God’s goodness to us on Sun 17th Sept with our harvest thanksgiving services. This year we will be staying on at church after our morning service for a lunch together. All are welcome as lunch is being provided and we would love you to join us. There will be no evening service as we are staying together following the lunch for a short informal service at around 3.00pm. Why not join us in celebrating God’s goodness to us in all his good gifts?